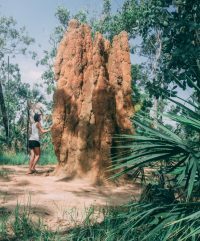 Amazing places to see between Cairns and Darwin - Explore the Outback! 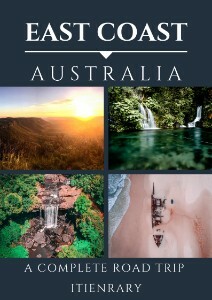 We’re fast approaching the last edition of our ‘places to see’ road trip itineraries for Australia but this time we’re heading further inland than we’ve ever been so far. I never imagined there’d be so many amazing places to see between Cairns and Darwin, especially since we decided to head down and west instead of over the top to follow the coast as many do. 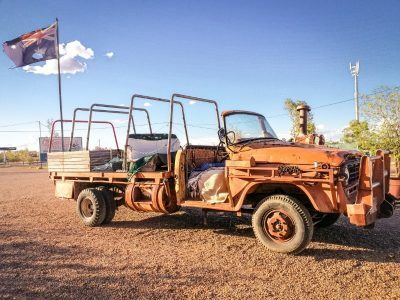 This leads to some pretty unique and interesting places though (as well as one pretty famous film location) so if you’re looking for an alternative route to Darwin from Cairns, this is it. Along with our itinerary this time we’ve included where we camped too as it’s a long old drive between these two cities! 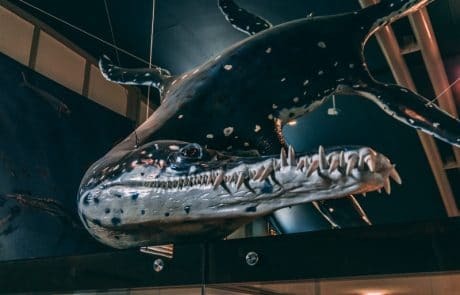 Our route to Darwin took us down to Townsville first and then inland west from there so if you haven’t already, check out our Brisbane to Cairns road trip itinerary to see what little gems lie on the Far North Queensland Coast. 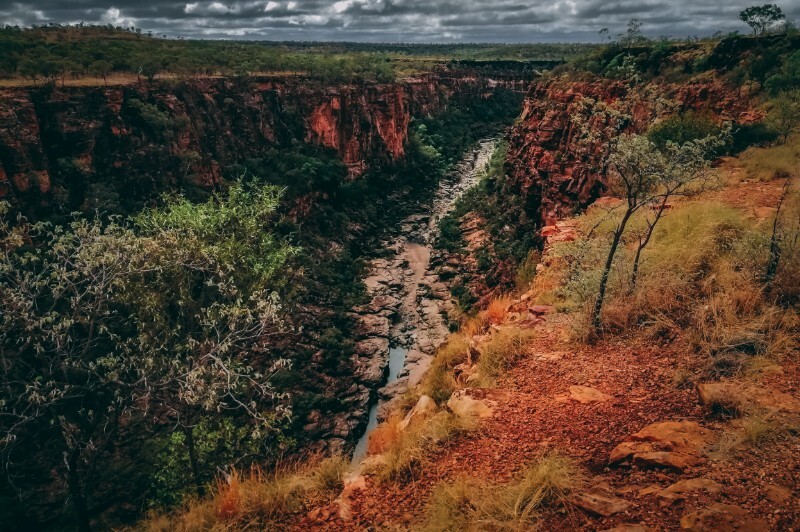 The first stop on our outback road trip from Cairns to Darwin was Porcupine Gorge. 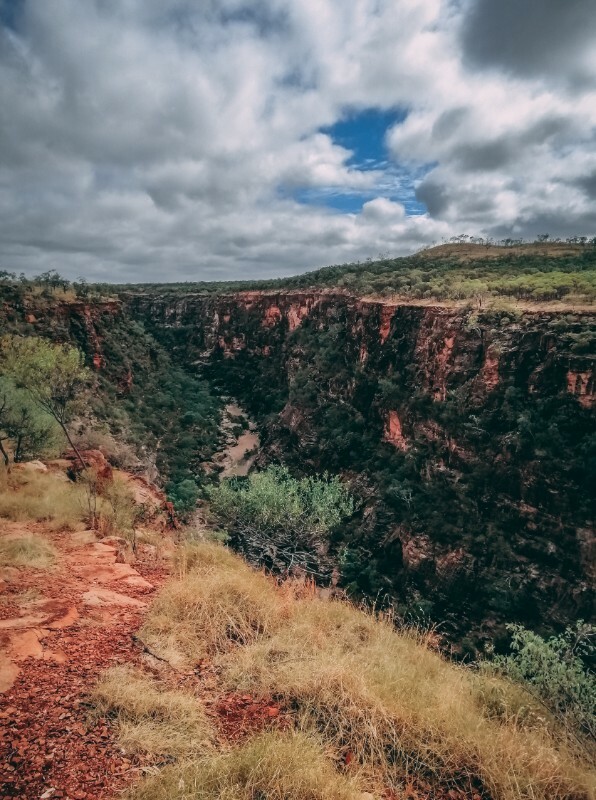 If you want to get a sense of just how big and old the Australian landscape is, Porcupine Gorge will help you with that. The Gorge has been forming for over 150million years and after the rainy season, the river still flows strong, carving new edges to the walls every year. There are a few different viewpoints for the Gorge, the furthest away is the Pyramid lookout; here you’ll be able to see some of the oldest parts of the Gorge with a good description of how far back each layer dates. Next is Bottle Tree Lookout which doesn’t look directly over the Gorge but still gives you a good vantage point over the rest of the area. Our favourite lookout was the namesake ‘Porcupine Gorge lookout’ as this gives you the longest stretch of views across the gorge and in mid-December, there was still a teeny bit of water at the bottom here. Other interesting points of interest at Porcupine Gorge include the postman grave next to Bottle Tree lookout, complete with his story. We found a nice but very basic campsite just south of Pyramid Lookout. 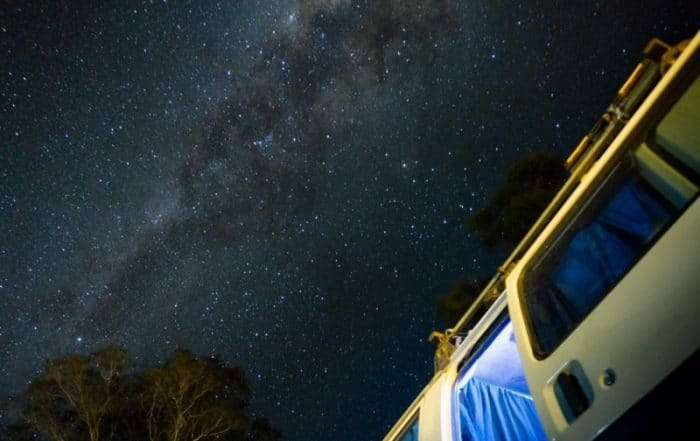 If you don’t require the ritz while you’re travelling, there’s plenty of free camping between Cairns and Darwin, it’s just knowing where to look. WkiCamps is usually a good place to start. I’ll add a Google pin here. 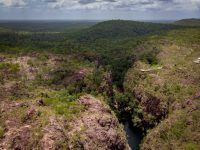 Here’s a great guide to the famous jumping croc tour, if you fancy getting up close and personal to wild crocodiles while you’re in the Northern Territory! 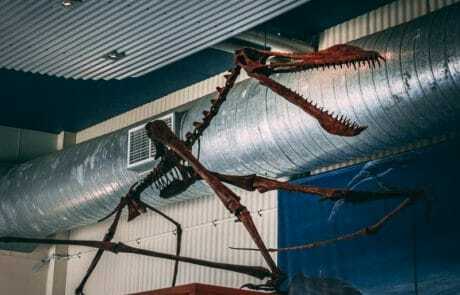 Richmond is 1/3 of the Australian Dinosaur Trail, we didn’t do the other 2 parts as they’re quite a bit south but if you have the time here’s more details on them. 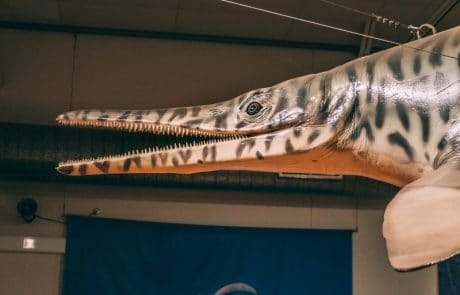 If you like a bit of prehistoric history and looking at fossils or bones, you’ll love Richmond’s Kronosaurus Korner marine fossil museum. 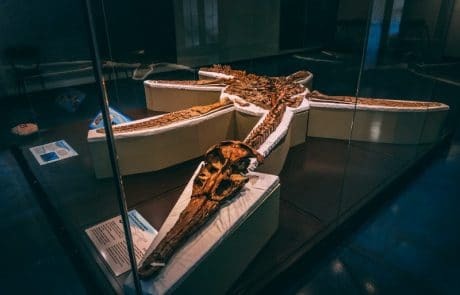 Home to some of Australia’s best-preserved fossils and most complete dinosaur remains, the Kronosaurus Korner is a really unique place to see between Cairns and Darwin and at $25pp* we got more than we expected from the experience. It’ll teach you about Australia’s massive inland sea and how most of the prehistoric remains found within the outback are marine animals! 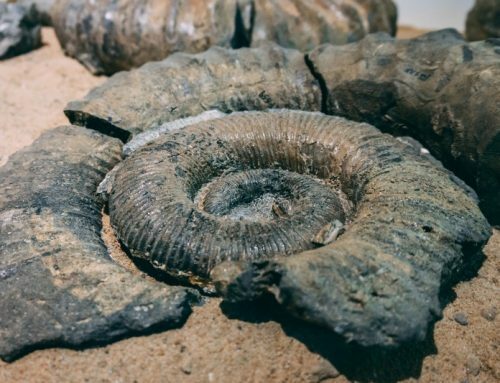 There’s also a public fossicking site at Richmond so anyone can go and try and find their own fossils. To do this all you’ll need is a $5pp pass, suncream and heaps of patience. The roads to Richmond from Porcupine gorge are all sealed roads, meaning it’s accessible in all weathers if you don’t have a 4×4. They’re also pretty long, straight and pass through cattle fields so don’t let yourself get distracted! 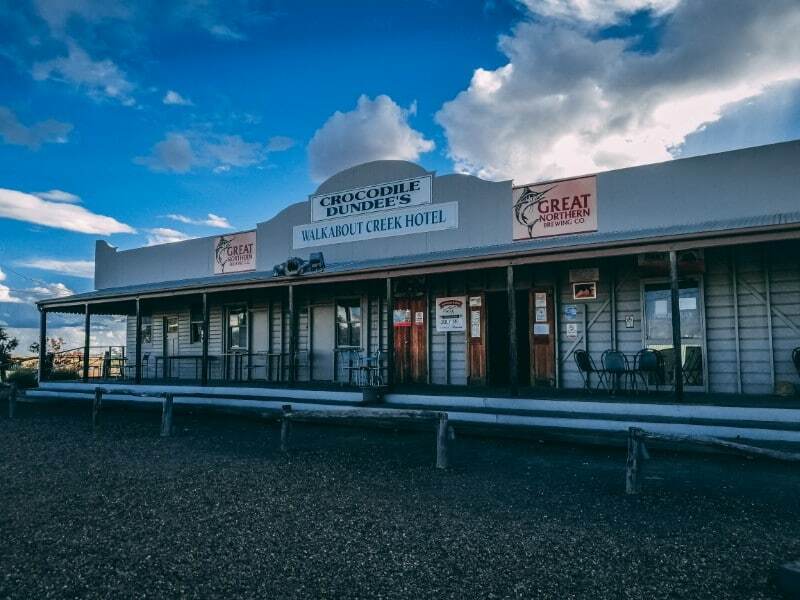 Walk About Creek Hotel should sound familiar to you but if it doesn’t, I might be showing my age here. 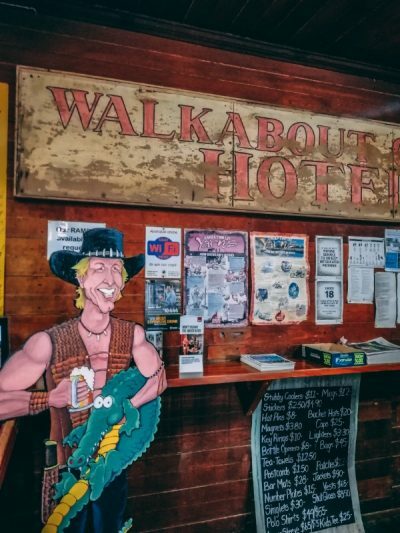 This famous pub was the filming location for the bar featured in Crocodile Dundee, and to my surprise, it’s still a fully functioning pub serving beer and food, which makes it the perfect place to stop between Cairns and Darwin to escape the heat. In the films, the interior was a specifically built set which the hotel owners were able to keep and still have set up and open to the public in their back garden. In front of the pub are Mick Dundee’s truck and Walters white car. Our next camp spot took us to Fullerton River rest area. Not that there was any water in the river at this time of year. This rest stop does have toilets this time as well as benches and plenty of shade. 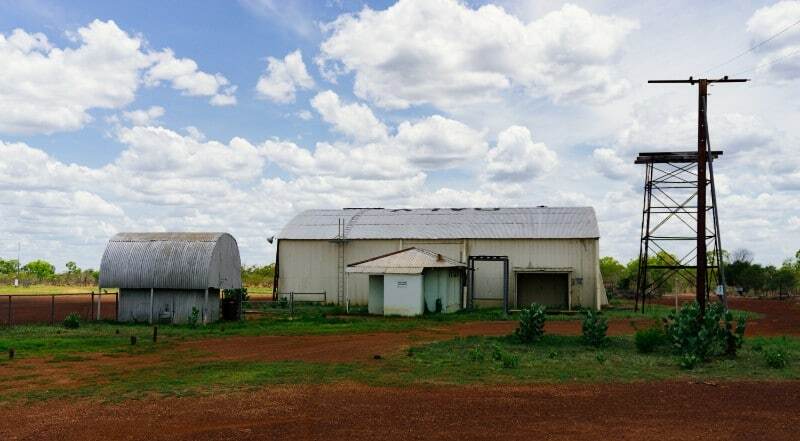 Camooweal is the last town before the Northern Territory border (And the last fuel for 3 hours) but just south from the town is the Camooweal Caves or Nowranie Caves. These caves are different from the ones we saw at the Jenolan Caves, NSW, as they’ve been formed underground instead of in the side of a mountain or hill. 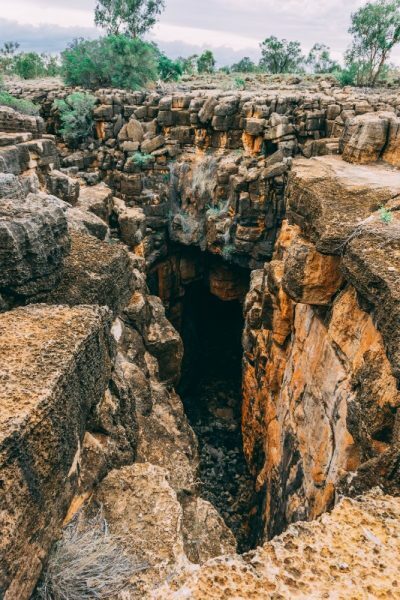 Camooweal Caves are over 100m deep and go well below the local water table, meaning after heavy rains they’re often flooded. There are two caves at the Nowranie Caves site, on you can walk right to the edge of and the other; the Great Nowranie Cave, is fenced off with a viewing platform. The road to Camooweal Caves is all dirt track with lots of pebbles and rocks in places. It also goes through an open cattle filed (like many of the roads in the outback) so you’ll need to keep your eyes out for wandering stock. That being said, it’s still doable in a 2WD if you take your time and if the track isn’t too wet. As you’re coming into Camooweal there’s a road leading left near the BP garage. Follow this track until you see signs for the Nowranie National Park – google will want you to go straight on but go left with the signs. From here the track gets rougher but nothing our little van couldn’t handle. While there is a paid campsite in Camooweal, there’s also a beautiful free camp spot just over the bridge on the way out of town (google pin here). It’s supposed to be a riverside camp but in the dry season it dries up, so it’ll depend on when you visit what sort of view you’ll get. Even without the river, we were still treated to a beautiful sunset and plenty of stars, the road noise is minimal but the flies can be pretty bad. Fly nets are essential when road tripping the outback. 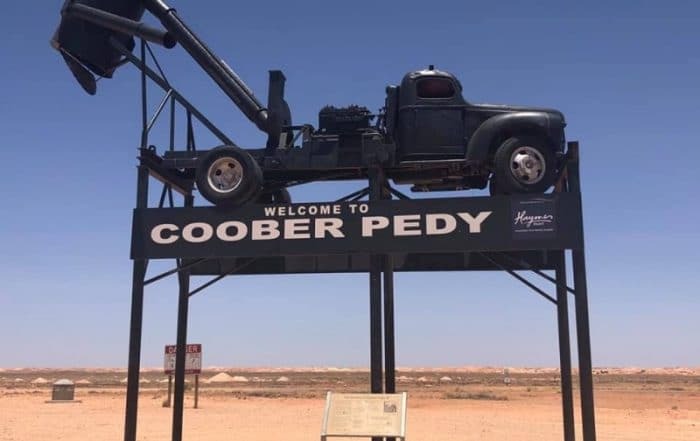 This is a pretty big jump between stops but from Camooweal to Daly Waters there’s either not much to see, or it’s stops that you’re going to have to stop off at; like the 3 ways Road House, because it’s the only fuel stop for miles. 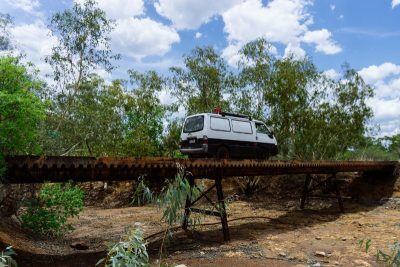 Once you cross over into the Northern Territory, it becomes clear that there’s a lot of history up there. It’s where a lot of the military was based during world war 2 and surprisingly, there’s a lot remaining from then! Between Elliot and Daly Waters there’s everything from old war barrack ruins, air bunkers and bridges used to cross the rivers during the war. 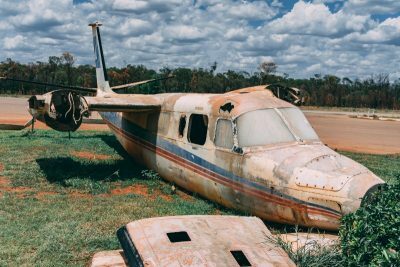 There’s also Australia’s first international airport at Daly Waters and while it’s no longer running, there’s still a lot that’s been left behind. By the time you get to Mataranka, you’ll probably be pretty fed up of the heat and desert. That’s not to say it isn’t pretty to look at, but there are only so many days you can take of long drives in 35+ humid heat. 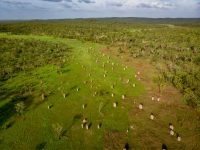 Thankfully Mataranka is an oasis in the desert and from here you’ll start to see the land change back to green. 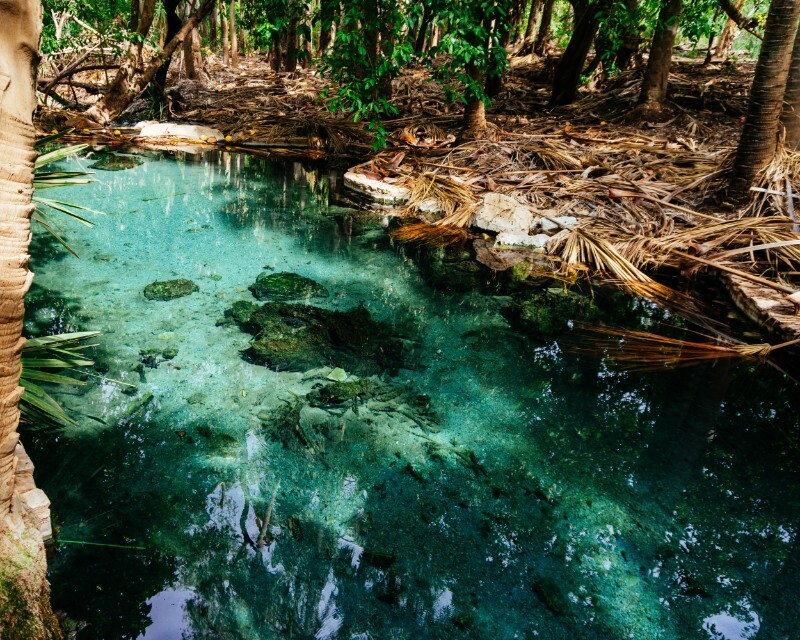 Leave yourself at least a day for Mataranka, especially if you want to enjoy a few hours at the thermal pools. 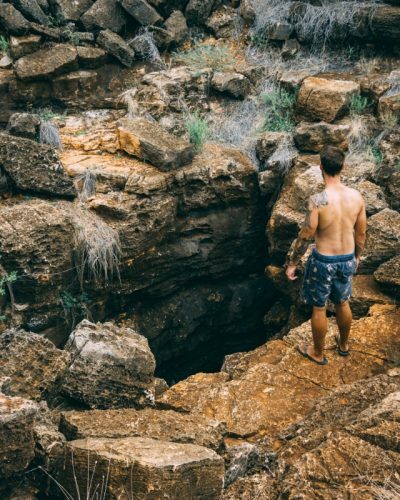 There’s also a couple of walks you can do from the thermal pools, one to the Rainbow Spring that feeds the thermal pools and another slightly longer walk that takes you to Stevie’s Hole; A river that’s a popular spot for crocodile spotting. Only Mataranka Thermal Pools are safe for swimming. All other waterholes in the area are home to fresh and saltwater crocodiles. 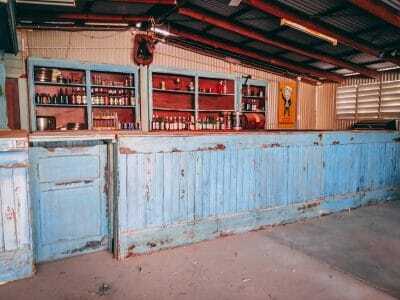 If you enjoy looking at film sets, Mataranka also has a replica of the homestead used to film ‘we of the never never’. 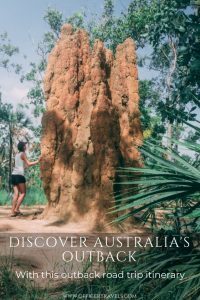 A film similar to ‘Australia’ about the first settlers and how they dealt with life in the outback. We’ve never seen the film but the set is interesting and there’s plenty of history explained too. 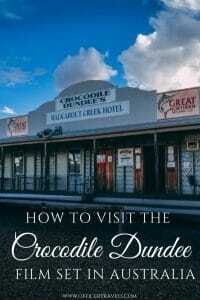 If you’re a crocodile Dundee fan, Adelaide River Road House is a must-see on the route to Darwin. Anyone who knows the film by heart will remember the buffalo taming scene where Mick puts the buffalo to sleep with his hands. 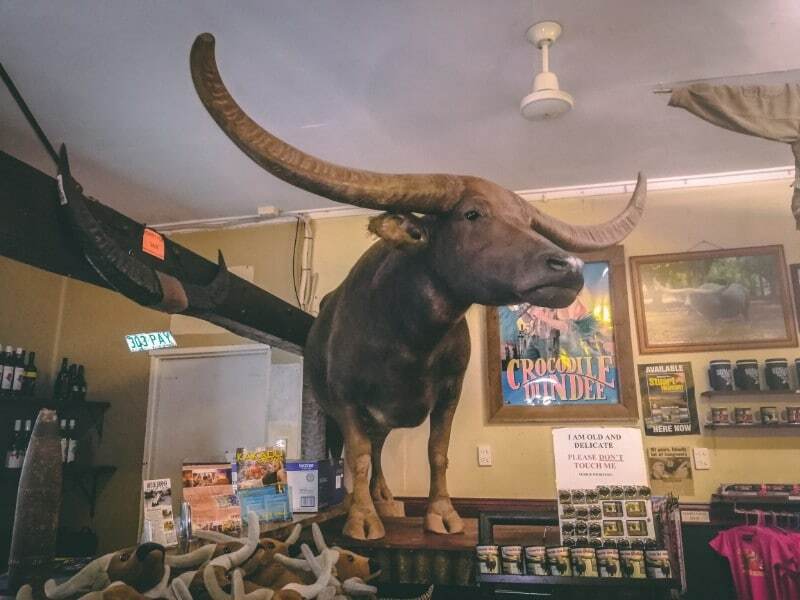 Well, this Buffalo belonged to Adelaide River Road House and now spends his resting days on their bar (yea… he’s stuffed). Another impressive feature at the Adelaide River Road House is ‘Joc the Croc’, another stuffed friend of the snapping kind. Joc was a nuisance 5.2meter crocodile in the nearby creek so he was controversially captured and ‘rehomed’ to Adelaide River Road House. Their food and fuel are also pretty cheap when you take into consideration how isolated it is although going to see the Buffalo is completely free. We camped just south of Adelaide River at Bridge Creek rest area. Again this was a very basic camp but it was away from the road so noise was minimal too. Here there was toilets, bins, shade and places available to make a fire if you wanted to. No drinking water here though. Litchfield National Park is an amazing little National Park detour no matter which direction you’re heading. 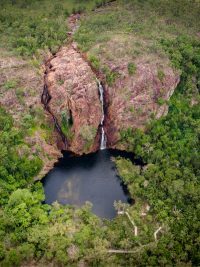 Filled with beautiful waterfalls and unique natural sculptures in the form of huge Cathedral and Magnetic termite mounds, Litchfield National Park deserves more than just a quick fly through. If you’ve read out other posts about waterfall routes you’ll know that we love a good waterfall or two, who doesn’t! But Litchfield National Park goes beyond that. I think it’s because you know you’re so close to the desert, so it leaves you wondering how you could possibly be surrounded by so much greenery. I don’t know but either way, you’d be crazy to not even do it as a day trip from Darwin! Want to visit but don’t have your own vehicle? 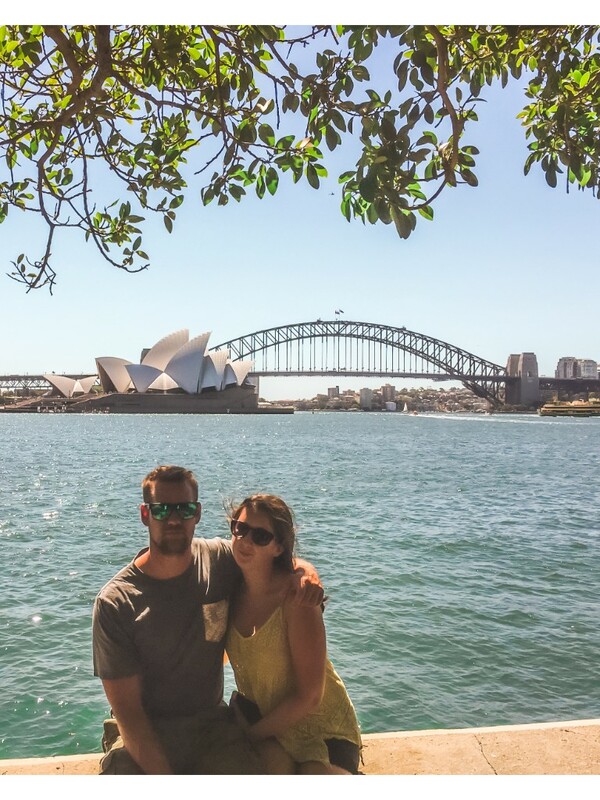 Try a tour with GetYourGuide and don’t miss out!! This is the penultimate episode of our ‘places to see’ road trip series and I think our final chapter is going to be the best one yet. 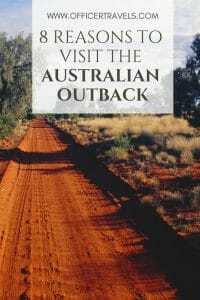 Have you explored the Australian Outback? Just the thought of being in the middle of nowhere puts a lot of people off but trust us when we say, it’s amazing. We’d love to hear your thoughts on the topic, why you chose not to do it or what you thought about it if you did!! Drop us a comment or catch up with us over on our facebook!! 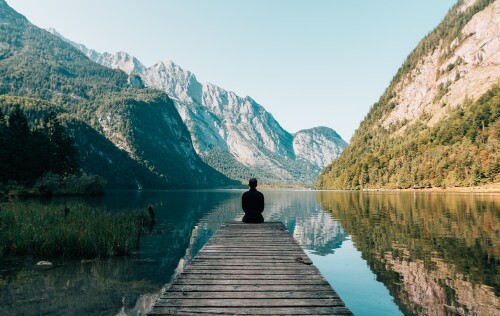 Other road trip posts we think you’ll love!